National Payroll Week is Sept. 3-7 and is meant to recognize and celebrate the contributions of workers throughout the United States and the payroll professionals who make sure employees are paid timely and accurately. Check this out—there are about 250 payroll professionals Countywide who work towards processing over 475,000 paychecks a year. That’s a lot of checks! Our County payroll professionals were recognized Tuesday at the County Operations Center with a proclamation from the San Diego County Board of Supervisors. 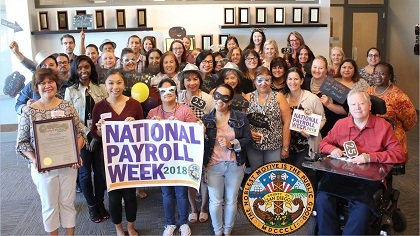 The proclamation commended our payroll professionals for their outstanding service, leadership, and commitment to payroll, and declared the Labor Day week to be “National Payroll Week” throughout San Diego County. View a photo gallery of the event and see your payroll professionals here.